In the recent HBO limited series, “Big Little Lies” (based on the book by Liane Moriarty), we spend 6 episodes hearing about a murder that happened at “Trivia Night”, the annual big school fundraiser, whose theme that year was Audrey & Elvis. You guessed it - each parent who attended the fundraiser had to dress up as either Audrey Hepburn or Elvis Presley. Which you would think would be super boring, to have every parent dressed up as the same celebrity. But it wasn’t! Instead, it made you realize just how many different iconic, recognizable looks both Audrey and Elvis had over the years. Take Elvis, for example…looks ranged from the Jailhouse Rock era, his Hawaiian phase, his stint in the army, the whole mutton-chops sideburns and leather thing, the now-iconic Vegas shiny white bell-bottomed suit, and of course, this Deluxe Gold Satin Elvis Costume. In our opinion, this is when Elvis was at his best - he was still hip-shaking and camera-ready, but on a whole new level than he had ever been at his career. He was big enough to headline Vegas, and confident enough to pull off a gold satin suit. It takes certain kind of man who can strut around in lame and still be taken seriously, and nobody did that better than Elvis. 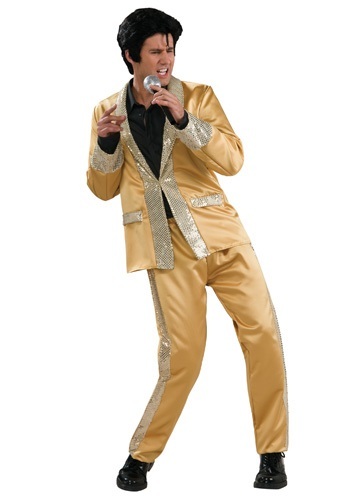 Slip on this officially licensed Deluxe Gold Satin Elvis Costume, and you’ll be ready to impersonate the King of Rock & Roll back when being King mean all gold, all the time!